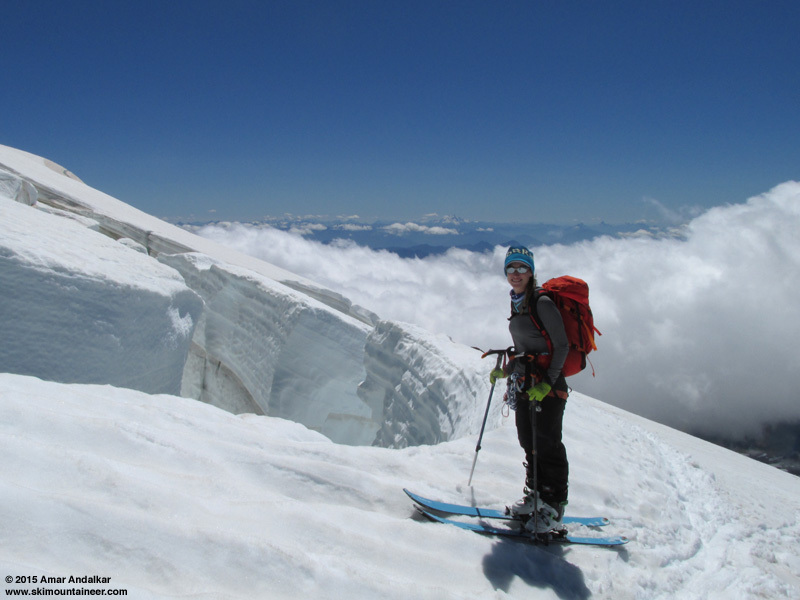 Summary: Enjoyed an outstanding summit and ski descent of Mount Baker via the Squak Glacier with Jill Yotz on the last really nice weather day before our recent late-July cloudy-rainy spell, finding the route in unexpectedly fine condition for skiing. Continuous skiable snow extends from about 6 ft below the true summit of 10781 ft Grant Peak, all the way down to about 5950 ft below Crag View, a continuous run of over 4800 vertical feet which probably exceeds anything else in the lower 48 right now for the combination of quantity and quality. And the snow is really great except on the lowest part, mostly smooth and minimally suncupped summertime corn snow over much of the route, especially from 6500-8500 ft which offered the best high-speed turns, and also quite smooth above 10000 ft where significant new snow (about 6-12" settled depth) has fallen sometime recently. 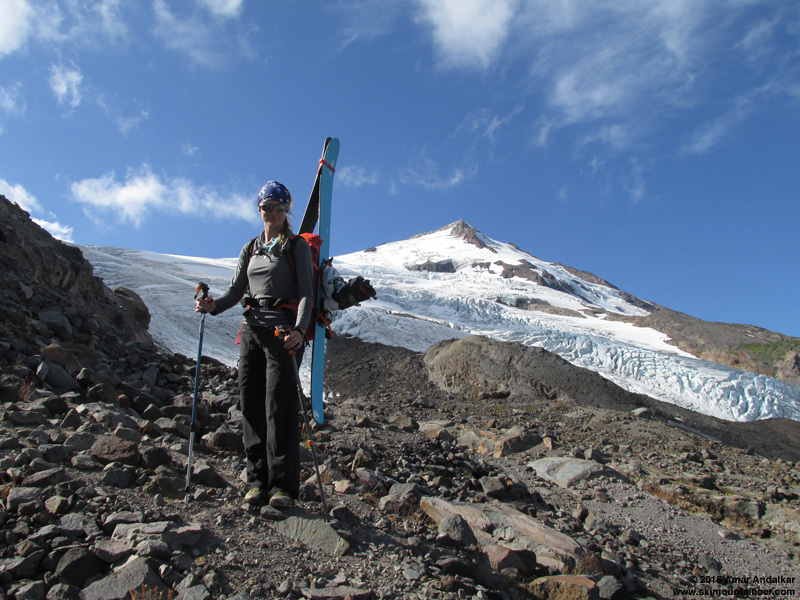 My 42nd Baker summit (all with ski descents), the most for me on any mountain, and Jill's first Baker summit, plus her first time leading a rope in crevassed terrain. And all in near-complete solitude too, as we saw only a single guided climbing party all day and no other skiers or climbers. 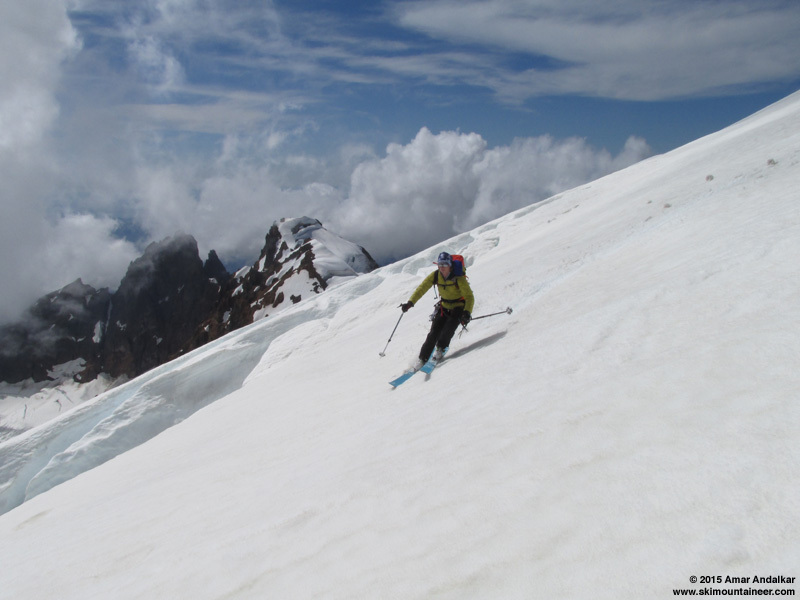 The Squak should continue to offer a fine ski descent into August once the weather clears out again and high pressure rebuilds. The current spate of cloudy and wet weather might even make the route smoother than it was on the 20th. 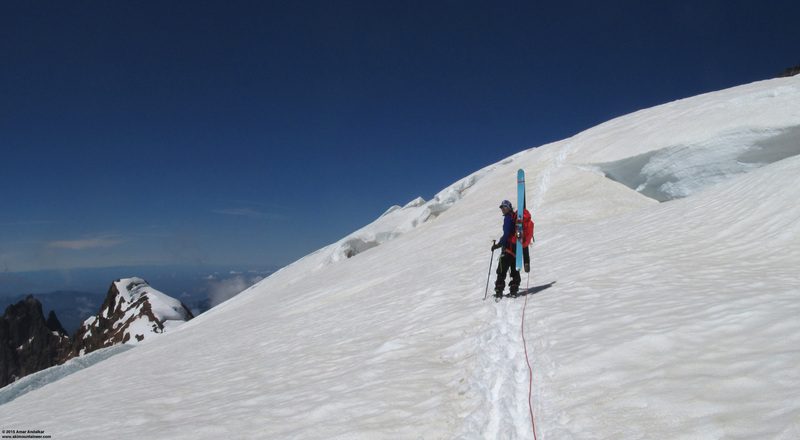 Details: Mount Baker is one of my favorite ski descents, especially so during mid and late summer when it typically provides 5000-6000 vertical feet of continuous skiable snow from the summit extending down to and past the termini of the south-side Easton and Squak Glaciers, throughout the lean months of August and September when everywhere else is just leftover scraps. By far the best late summer ski runs in the lower 48, perhaps the best anywhere in the world too, given the lack of access to comparably good summer skiing in Alaska. 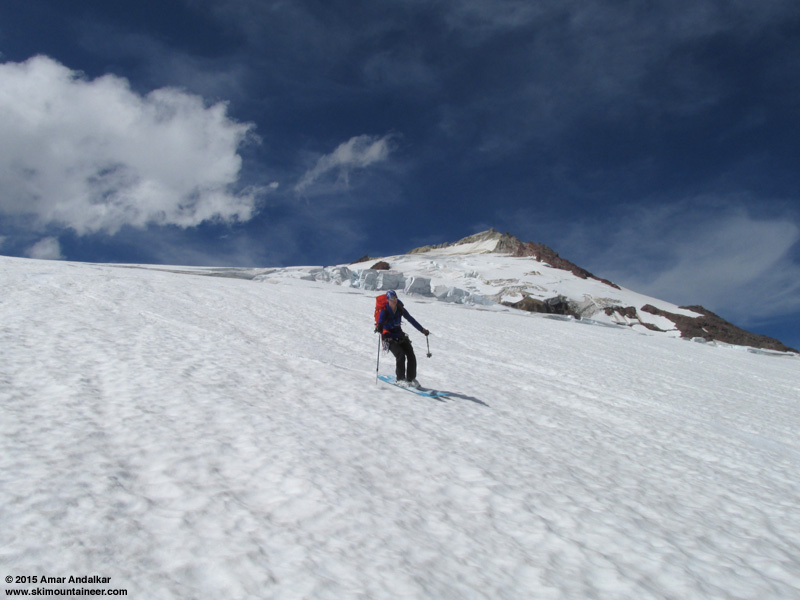 However, the bizarre and anomalously extreme-low snowpack of the 2014-15 season has put even this most reliable of summer skiing destinations into doubt. 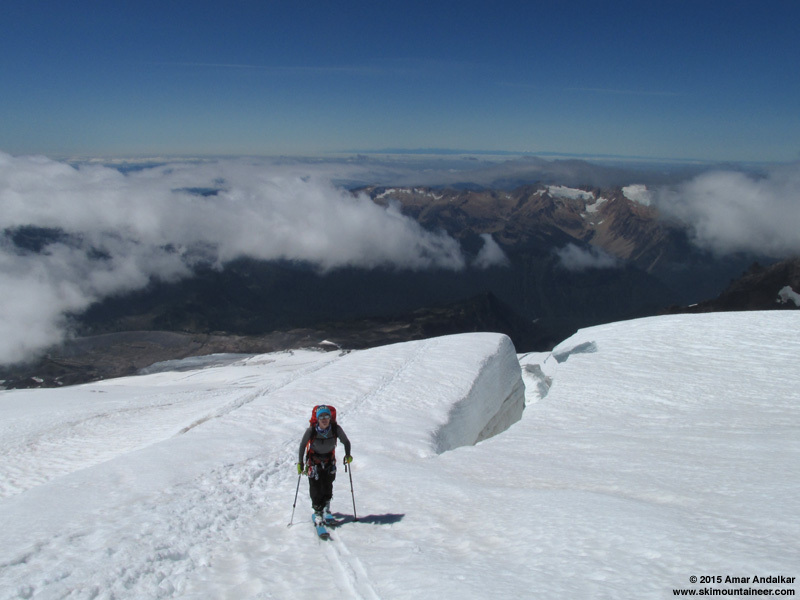 The (very few) recent reports over the past 1-2 months sounded mostly negative and depressing, with tales of gnarly open crevasses and difficult travel both on the Roman Wall and on the glaciers below, with basically no summer snowpack extending off the glaciers by July. 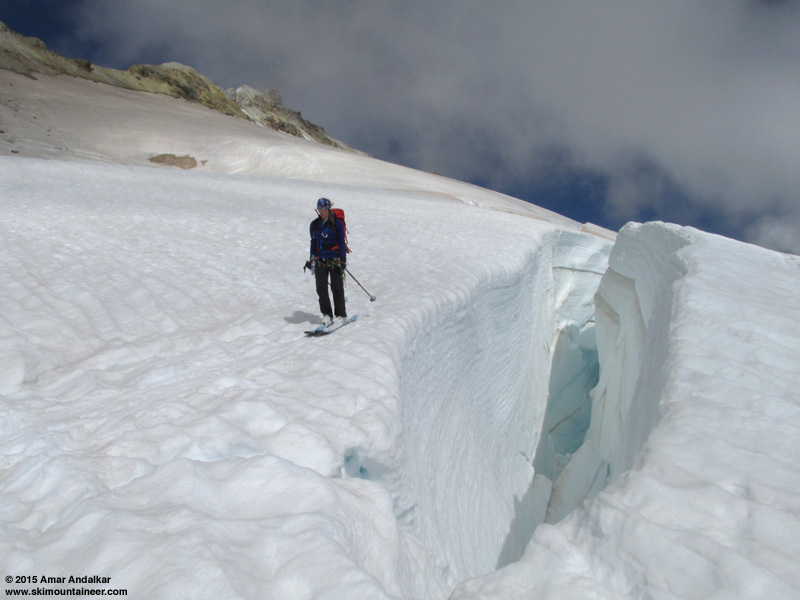 Even the Mount Baker USFS climbing ranger blog had reported in early July that the standard Easton route had developed an impassable crevasse near 9200 ft, with all south-side parties now diverting over onto the Squak route instead. I hadn't been up Baker in 2015 at all due to various circumstances, mainly it was just always having some other ski objective on every single day I would have skied Baker thus far, along with a reluctance to solo it right now. So I wasn't sure whether to trust the reports at face value, or take them with a grain of salt as the over-reaction of those who expected the usual no-crevasse-issues-at-all conditions of a fat spring snowpack on Baker, and simply were not used to seeing the route looking more like typical heavily-crevassed late-summer conditions. 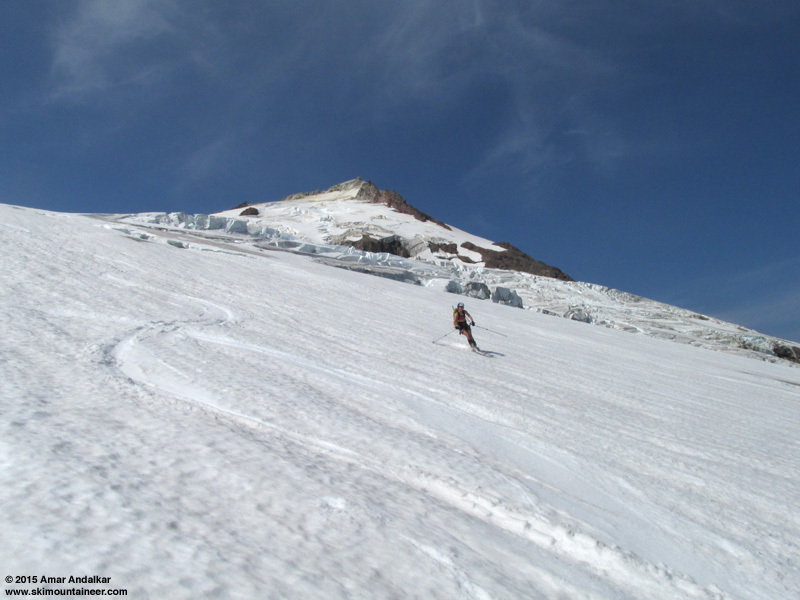 The last times I'd been up Baker had been skiing it 5 times via Easton Glacier throughout August 2014, when strangely enough the Squak had an impassable crevasse at its usual crux near 8900 ft by July while the Easton remained passable all summer. After skiing it now, my overall impression is that the route is in really good shape currently (all things considered) and appears to be quite safe on skis. 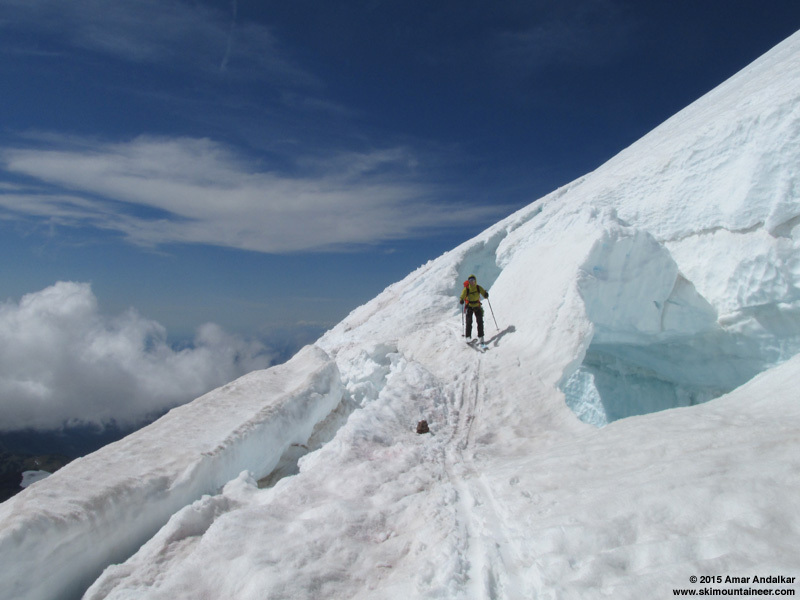 Yes, it's more like typical late-August or September conditions now in terms of crevasses, but I've skied the Easton and Squak routes numerous times in those months in previous years so that wasn't a big deal to me. Sure, the glacier looks grim and bare near its terminus, but even that part skis OK, and snow cover is fine above 7000 ft. All crevasse crossings appeared to be solidly bridged as of July 20, and although a few looked somewhat sketchy and undercut to the eye, none required a rope or belay if on skis. 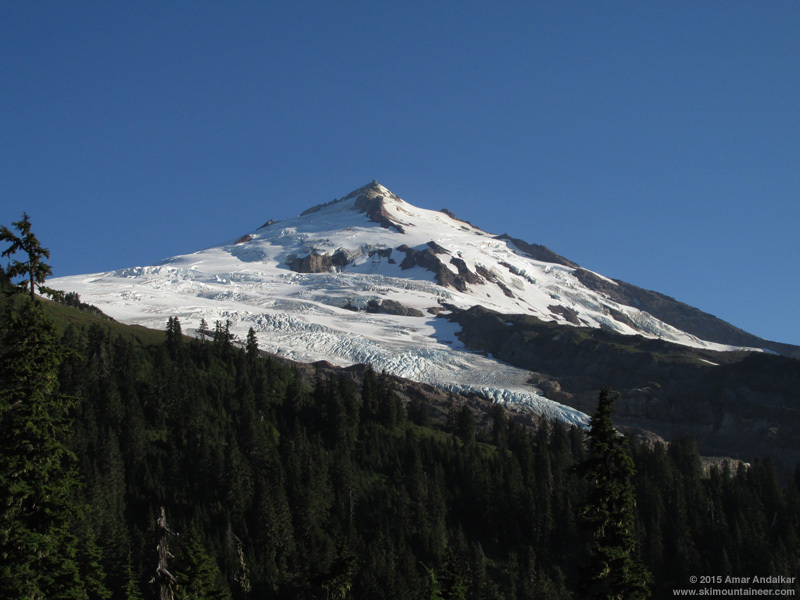 Sunday July 19 had unexpectedly ended up as the hottest day of 2015 thus far in western Washington, with a high of 95 �F at SeaTac topping the numerous other 90+ �F days during an unusually hot June and July. We drove up from Seattle on Sunday evening, enjoyed a nice sunset and the fading twilight on the dock at Baker Lake with lovely views of Mounts Baker and Shuksan, and then tent-camped in the Schriebers Meadow trailhead parking lot. No bugs at all, very pleasant camping once the temperatures finally cooled off late in the evening. 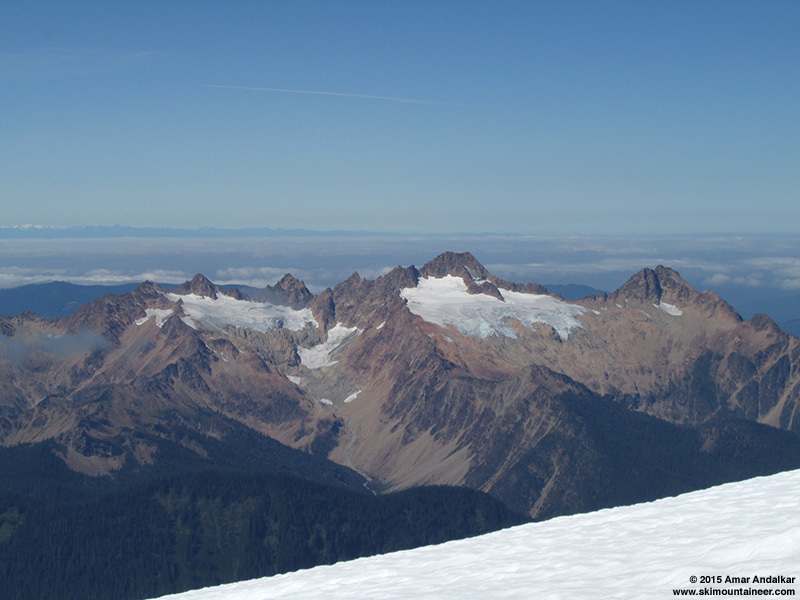 View of 10160+ ft Sherman Peak from the 4600 ft trail saddle, with Squak Glacier at left and Talum Glacier at right. Headed up the Scott Paul Trail the next morning around 6:20am, a bit later than planned, but it was nice to sleep in some more and eat some hot breakfast too. There are several large downed trees across the trail mainly in the first mile, but none were hard to clamber over, even with skis on the pack. We left the Scott Paul Trail at the 4600 ft saddle (2.5 miles) and continued up the climbers trail towards Crag View. Normally the route would be skinnable from near the saddle in mid-late July, but not this year at all. We expected to hike to somewhere above 6000 ft to reach snow, maybe even close to 6513 ft Crag View. The climbers trail is in good shape, but annoying in many sections due to poor placement needlessly going straight up steep terrain. 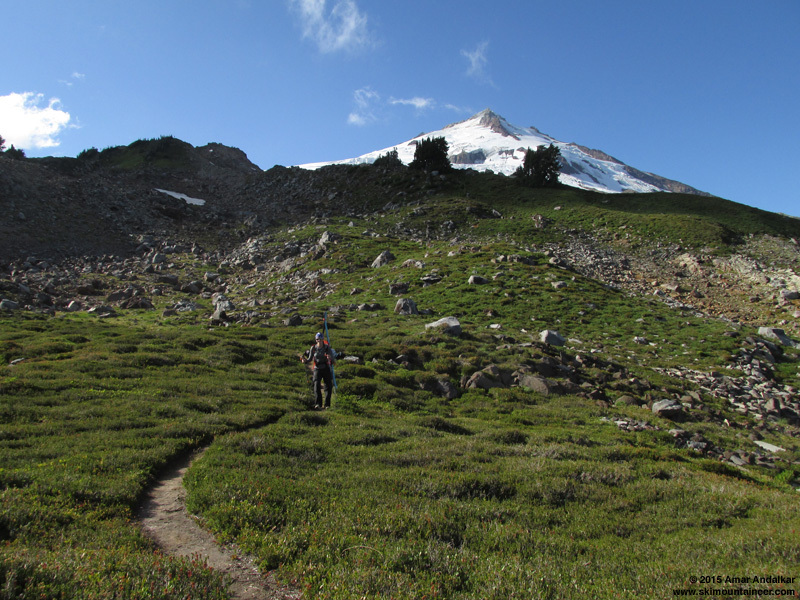 It also fades out and is hard to follow in several spots with multiple sets of erroneous cairns, but direct cross-country travel is easy enough too in the open subalpine terrain. 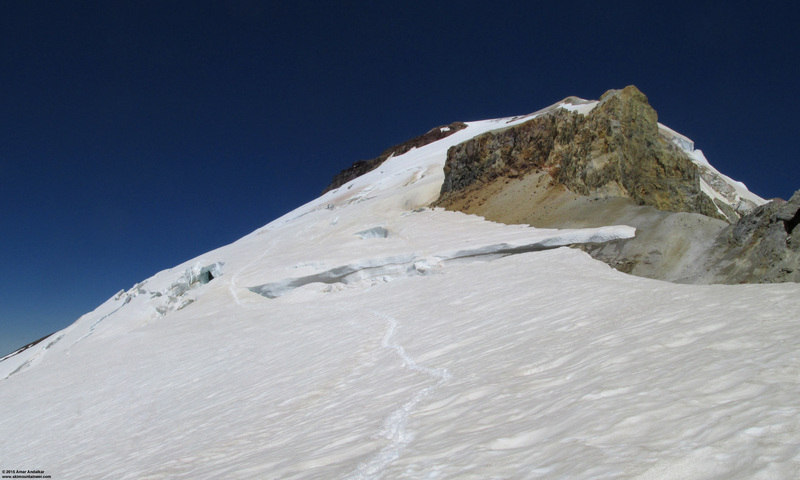 We left the climbers trail at the standard crossover spot onto the Squak Glacier at 5800 ft, now very strangely bare of snow, as there is normally continuous snow down to here even in September. We continued up through the rubbly moraines directly towards the glacier, with glacial polish and striations on most bedrock outcrops providing ample evidence of recent deglaciation of this area. An ominous looking lenticular-like cloud started building around 8:30am, streaming rapidly from west to east below the summit, but the forecast for the day looked solid and stable (although trending downward by evening), so it wasn't much of a worry. 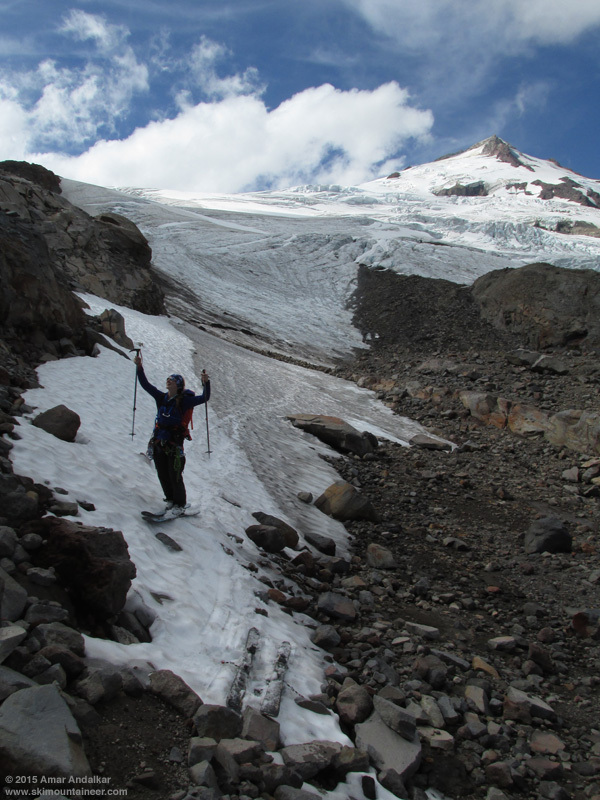 We were unsure how high we'd need to climb to hit snow, but were relieved to reach continuous snow and ice at about 5950 ft, just under 4 miles from the trailhead per the GPS. Not too bad of a hike at all, especially with glorious scenery on the upper half of it. Jill stoked to finally have the skis off our backs and on the snow where they belong instead. 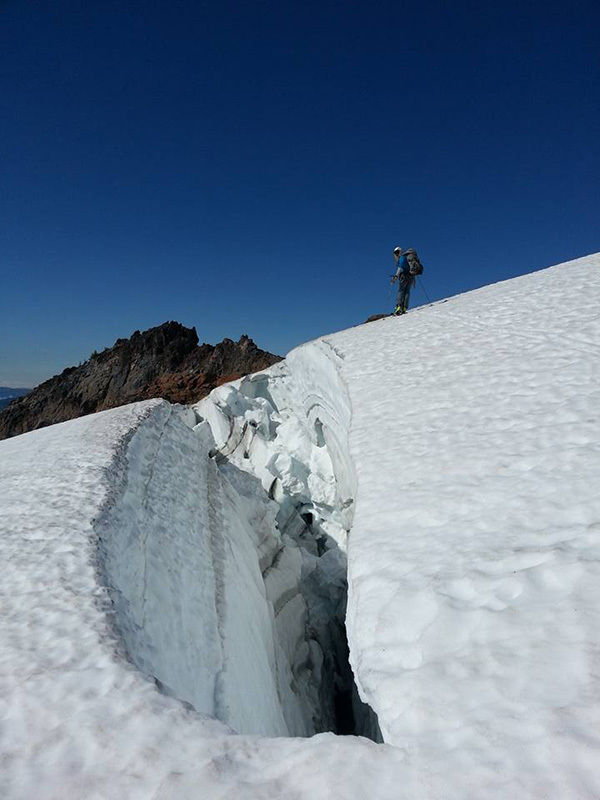 Obviously, the view from the edge of the snow showed that there would be a few sections of bare glacial ice to cross on the lower parts of the Squak Glacier, but it looked to be easily skinnable with ski crampons. We skinned up a bit after 9am, the warm sunshine had softened the old hard dirty snow (last year's snow!) just enough to make for tolerable skinning. 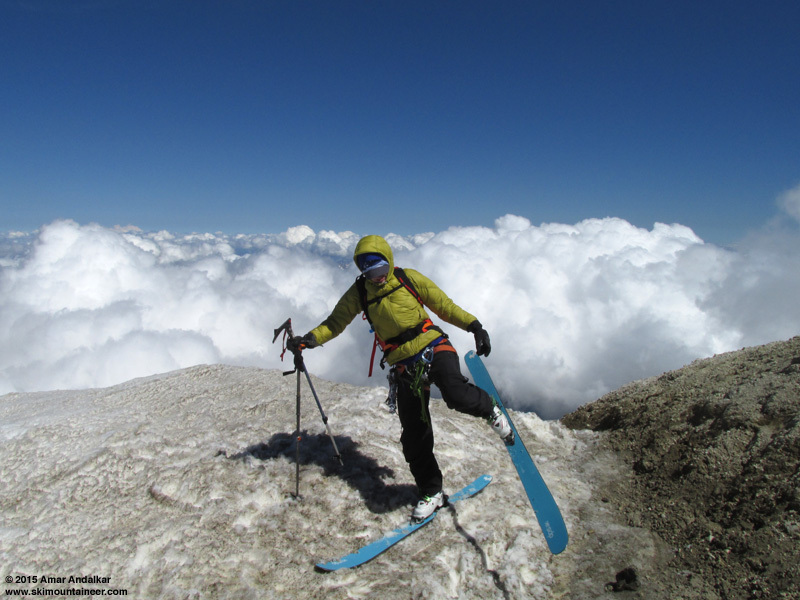 We decided to wear our climbing harnesses right from where we started skinning, but there was no need (on skis) to consider roping up yet. 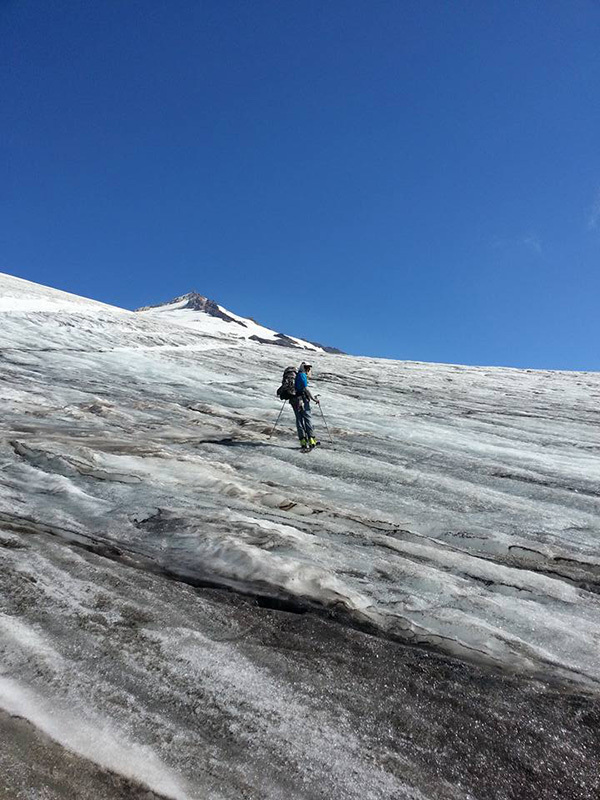 Especially because most of the early crevasses were completely open and obvious (and narrow) on the mostly snow-free blue ice of the glacier terminus. Even the bare blue glacial ice had softened just enough to make skinning up it not a problem at all. 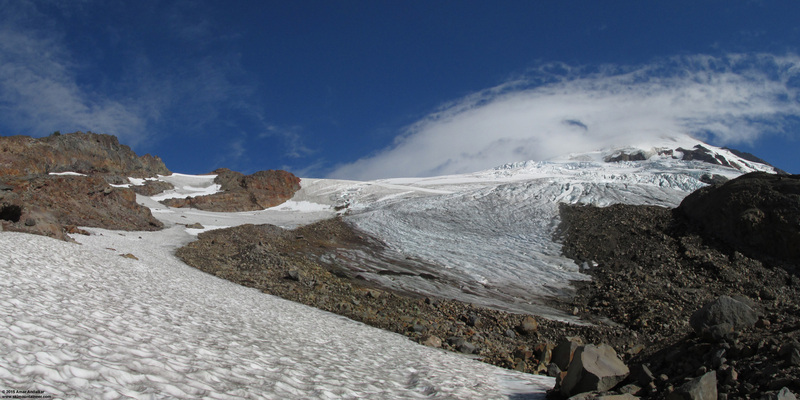 The lower portions of the glacier below about 7000 ft are a patchwork of 3 different surfaces: white barely-dirty snow from this season, grey very-dirty snow from last season, and bare blue glacial ice. 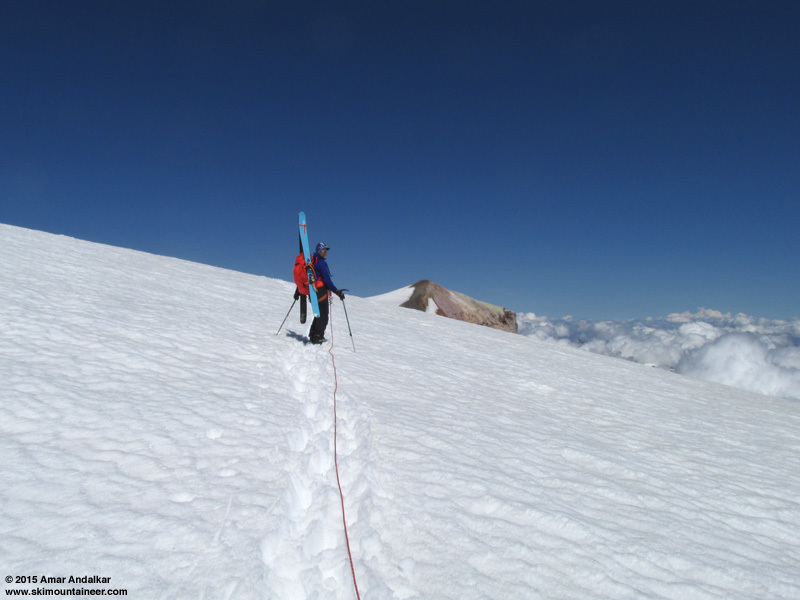 We end-ran to the left around one long crevasse near 6400 ft just east of Crag View, and then crossed a second shorter patch of bare blue glacial ice near 6500 ft. 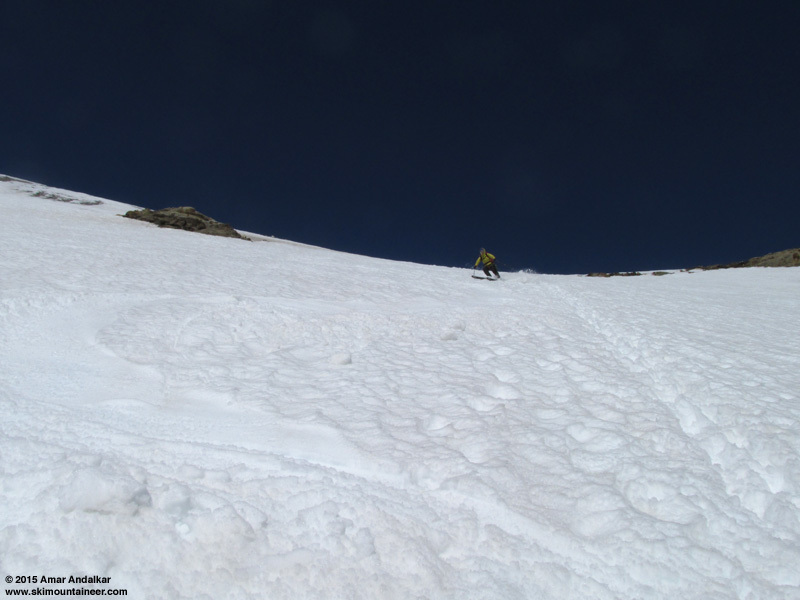 The next part up to 8500 ft was pretty much a cruise, mostly smooth white snow with a few thin cracks which could safely be crossed directly on skis and only occasional larger crevasses causing slight deviations from a straight course. 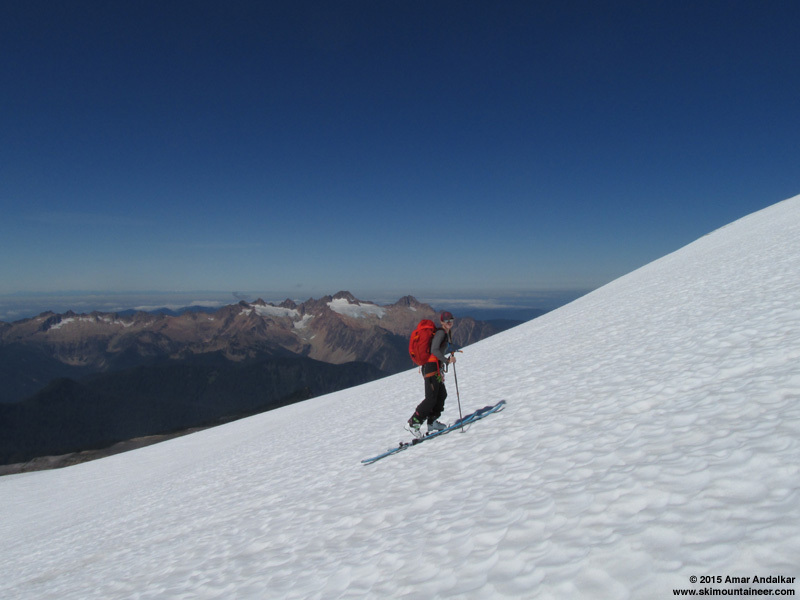 A bootpack from various climbing parties on foot was evident, but there was little evidence of any recent skiing. 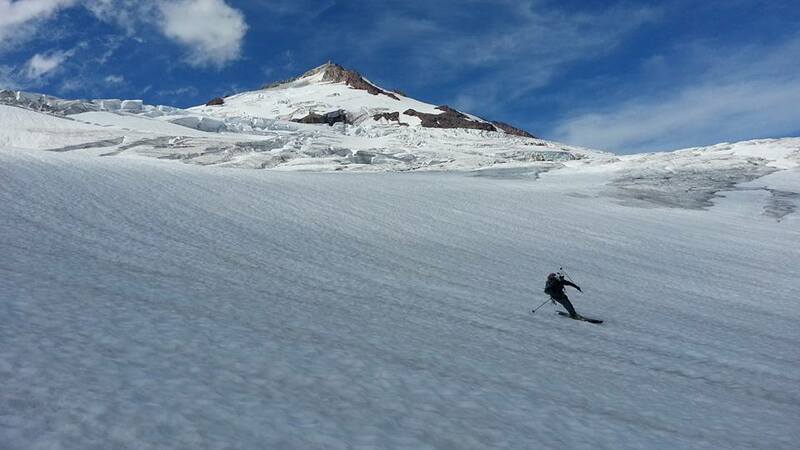 Skinning up a smooth part of the Squak near 7500 ft with Twin Sisters Mountain (7000+ ft) in the distance. Zoomed view of the mostly-bare glaciers on the northeast side of Twin Sisters Mountain (7000+ ft), with Mount Olympus (7965 ft) in the distance at left. Twin Sisters Mountain consists of a massive block of reddish-orange dunite, a chunk of the Earth's mantle pushed up many dozens of miles through the crust by geological forces. Dunite is therefore rarely found at the surface, and this is one of the largest such outcrops anywhere in the world. 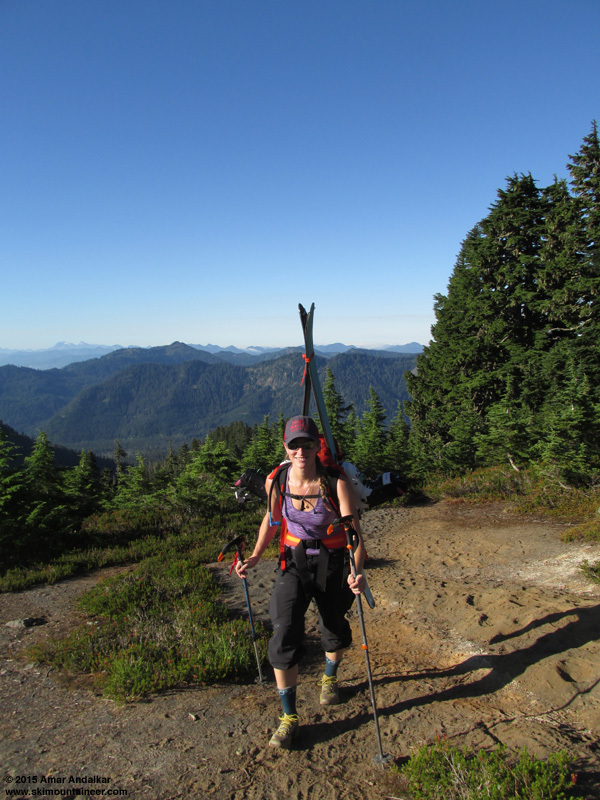 We had enjoyed total solitude on the entire route thus far, having seen no one since Baker Lake the previous evening, other than a distant person up on the ridge near Crag View as we traversed well below it to reach the Squak. 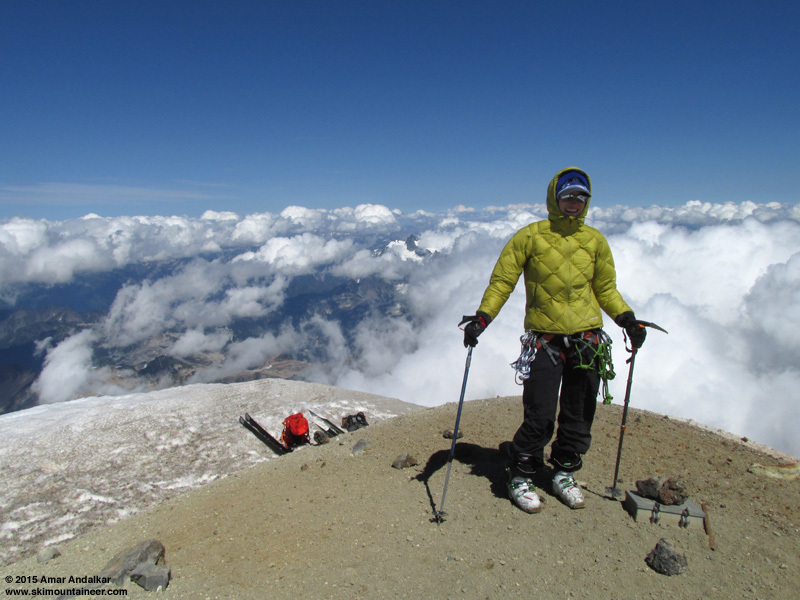 But as we neared 8700 ft around 11:30am, a Mountain Madness group of 7 climbers descended past us. 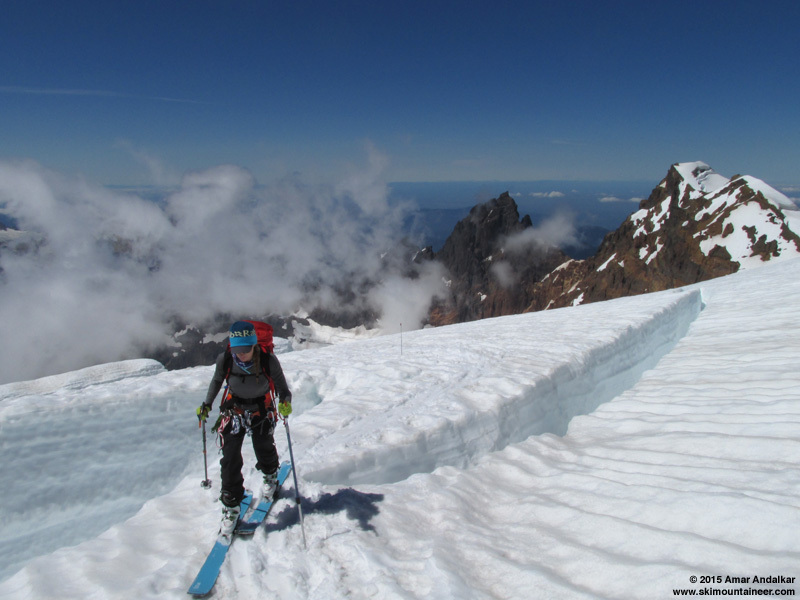 A brief chat with the guides assured us that the route above was in good shape, and seeing climbers on foot having just descended gave us renewed confidence that the snow bridges would be easily supportable on skis. The usual crux crevasse near 8800 ft was not an issue at all, it was very well bridged, and there was a large ramp between crevasses just above it. The sketchiest crevasse of the entire day was actually a bit above that, near 9300 ft, where the route went directly over a large crevasse on a thick but cracking snow bridge that was severely undercut on the uphill side. It looked like a flat and easy crossing while skinning towards it, until the undercut was suddenly visible -- lots of air under that bridge, and uncertain support for it! Skinning across the sketchy undercut crevasse bridge near 9300 ft, Jill is moving fast! There were a few more cracks to weave through above that, but all were solid snow to full depth with no more airy bridges. To get around the bergschrund at the top of the glacier, the route follows an unusually high path near 9600 ft through a bit of fallen rock right up against the bare ground extending up to the Sherman Crater rim, much higher than the usual junction with the Easton route near 9400 ft.
We took a long break here just below the rim of Sherman Crater to discuss our options and eat some lunch. We strongly considered trying to skin up the Roman Wall, especially given what appeared to be a proper switchbacking bootpack already in place (not straight up) and that the snow was nicely softened now after 12:30pm, plus the fact that we both much prefer to skin instead of boot. But having not been up the route recently, I just wasn't sure if there would be any skinning-incompatible spots which would make us regret that decision and force us to transition in some very sketchy exposed spot on the Wall. 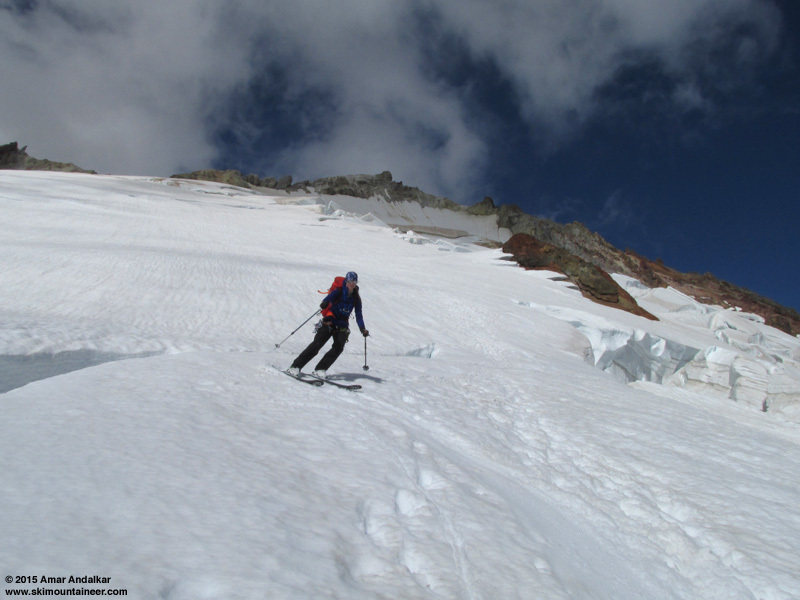 Overall, it wasn't worth taking the risk of that possibility which overwhelmed any safety advantage of staying on skis, so we transitioned to foot crampons and roped up. Jill took the lead, since I had by far the most crevasse rescue experience, it was best that I trail in case of a punch-through or snow bridge collapse. But the decent bootpack and recent descent of the guided party made those possibilities much less likely. Only a couple of snow bridge crossings which required some thought, but nothing truly sketchy. You could have a major crevasse accident on the Wall now, but it would take some severe missteps or some really bad luck. The upper part of the Wall above maybe 10000 ft was covered in about 6-12" of semi-consolidated newer snow, which must have fallen during a few spells of recent bad weather and thunderstorms. We reached the edge of the summit dome near 10600 ft around 2:20pm, about an hour after we had started cramponing at 9600 ft, so our progress up the Wall was fairly fast given the switchbacking and indirect bootpack. The southern rim of the summit crater (known as Carmelo Crater, which is completely ice-filled by the 10760+ ft summit dome) was visible through the new snow, so it must have melted out prior to the new snow falling. Continued in next post, exceeded 20,000 character limit . . . Continued from previous post . . .
We could have easily switched back to skins at this point for the long traverse over to Grant Peak, but it was faster to just keep plodding along on foot and not take the extra time to change over, especially in the gusty wind at the top of the Wall. 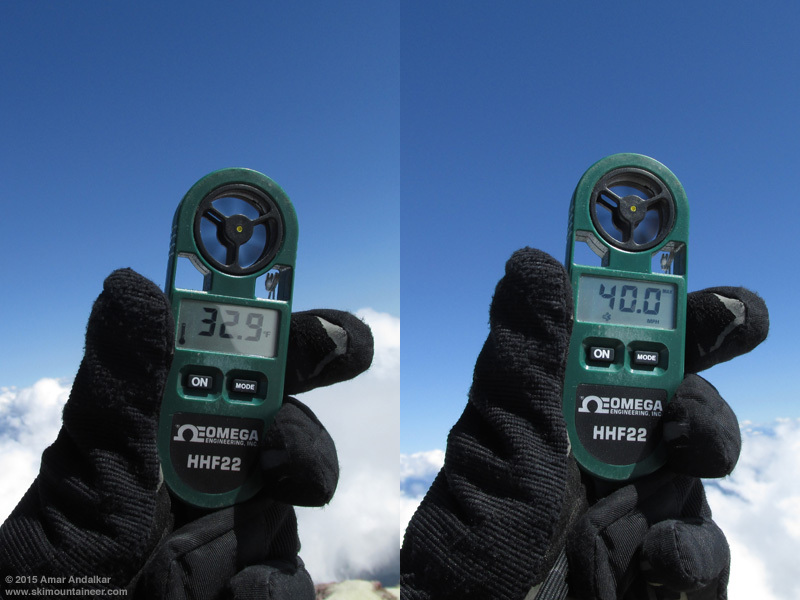 A fairly strong westerly breeze had been blowing in exposed areas since we got above 9000 ft, and on the summit dome it was quite strong, gusting over 30 mph. We reached the highest snow about 6 ft below the summit around 2:40pm, which also happened to be nicely sheltered from the wind, and left our skis and packs there. While we still had crampons on, we walked over to the edge and took in the vertiginous views looking down the Park Headwall. Far below along Ptarmigan Ridge we could see the very bare looking Mazama, Rainbow, and Sholes Glaciers, definitely carrying less snow cover now atop their glacial ice than they would even in September of a normal year. 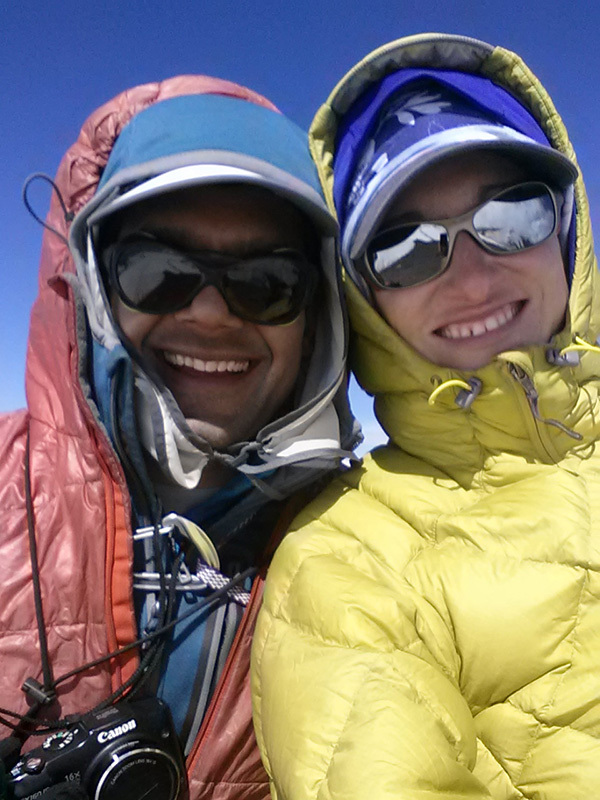 We decided to finish eating and transitioning to ski mode out of the wind before tagging the true summit. Finally headed up the last few feet of hydrothermally-altered clay-like dirt to the top after 3pm, into the full teeth of the westerly gale. 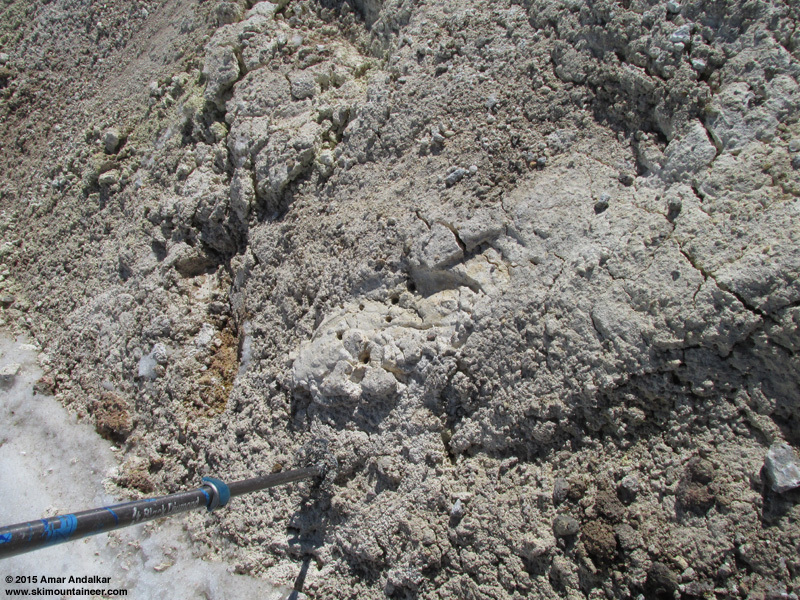 An oozing mini-mudpot of hydrothermally-altered sulfurous clay about 6 ft below the summit of Grant Peak. Wind gusts atop Grant Peak reached 40 mph with sustained 30 mph winds, in sharp contrast to the barely 10-15 mph breeze at our packs only 6 ft lower down. 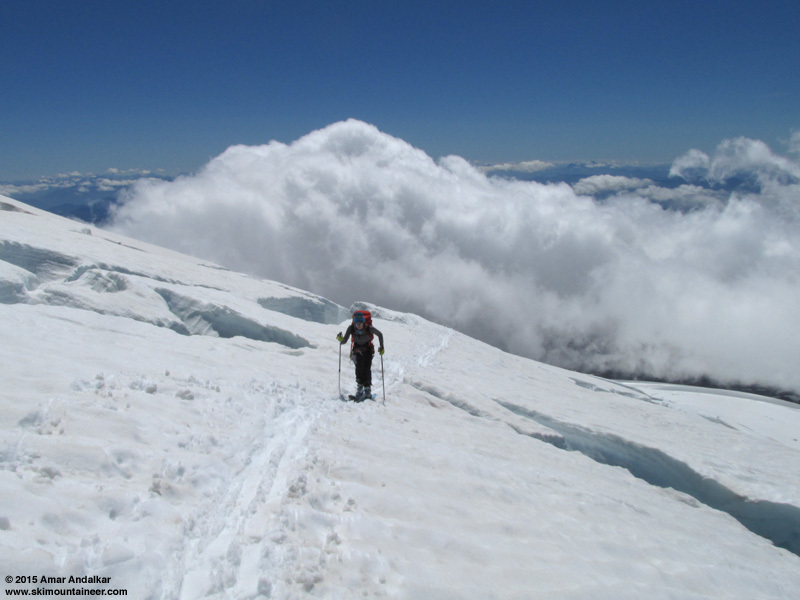 The air temperature was an unexpectedly cold 33 �F, surprising given the free air freezing level of over 13000 ft this day which would imply summit temperatures near 40 �F. This discrepancy is unusual, but explainable by the rapid adiabatic ascent of the westerly marine air as it flowed up and over Baker, which would cool that air to temperatures well below that of vertically sinking air under the influence of regional upper-level high pressure. A handy little gadget which I've carried on all trips for the last 10 years or more, although I don't always use it on the summit. Anyway, it was really very cold in that wind on the summit, such a sharp contrast from sweltering in the 95 �F heat in town the previous day! We lingered for only a couple minutes, I snapped a few photos and then Jill took a quick selfie of us, and we didn't even bother to open or sign the summit register. Finally, at 3:15pm, it was time to ski. Dirty snow for the first few yards, but then a nice cruise down to the summit plateau. 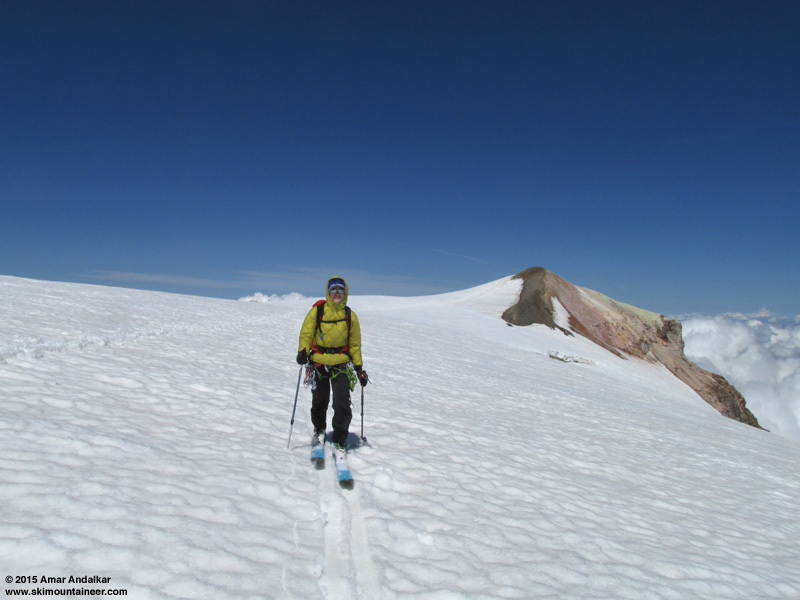 Despite the strong winds, the intense sunshine had softened the snow on the summit plateau and the southern flank of the summit dome nicely, and it was easy to set a nice traversing track back around to the Roman Wall with almost no reascent required. The upper part of the Roman Wall was oversoftened a bit, especially since the recent new snow was only semi-consolidated, but it still skied fairly well. Only one spot on the descent required a bit of work to shuffle and sidestep across a complex crevasse bridge, the rest of the Wall was fun skiing. After crossing back onto the Squak, it mostly easy sailing other than carefully threading through a few spots. In a few somewhat runneled and suncupped areas, the turns were much better for the second person if they followed the leader's tracks exactly, with a very noticeable smoothing effect. Below 8500 ft, the snow conditions improved to the best of the day, smooth and fast turns with dimples only 1-2" deep nicely softened in the warm sunshine. Even after we skied across the first blue ice near 6500 ft, there were still a few good turns to be found. Not as good after the second larger section of blue ice near 6200 ft, but it was still skiing. We skied continuously all the way back down to 5950 ft by 4:30pm, even a few dozen yards past the spot we had skinned up from in the morning. We took a nice long break to eat and transition back to hiking shoes, and even washed all the grit and ash off our skis and ski boots in a tiny stream flowing out the edge of the snowpack. Nothing left but the hike out, which took about 2 hours and brought us back to the car at 7:20pm, almost exactly 13 hours after we had left in the morning. Just an exceptional day in the mountains, with lots of really high-quality skiing as an unexpected bonus, so much better than we had expected. Over 4800 vert of mostly fine skiing for about 7600 ft of total gain roundtrip, not a bad ratio at all for midsummer after the worst ski season ever! Capped off with quesadillas, Caboose Burgers, and brown ales at Skagit River Brewing in Mount Vernon, arriving with just 5 minutes to spare before they closed at 9pm, but they nicely allowed us to linger past 10pm and fully enjoy our excellent meals. Fantastic finish to a fabulous trip! SYNOPSIS...THE UPPER RIDGE OVER THE REGION WILL WEAKEN MONDAY...AND AN UPPER TROUGH WILL MOVE INTO THE PACIFIC NORTHWEST TUESDAY AND WEDNESDAY. 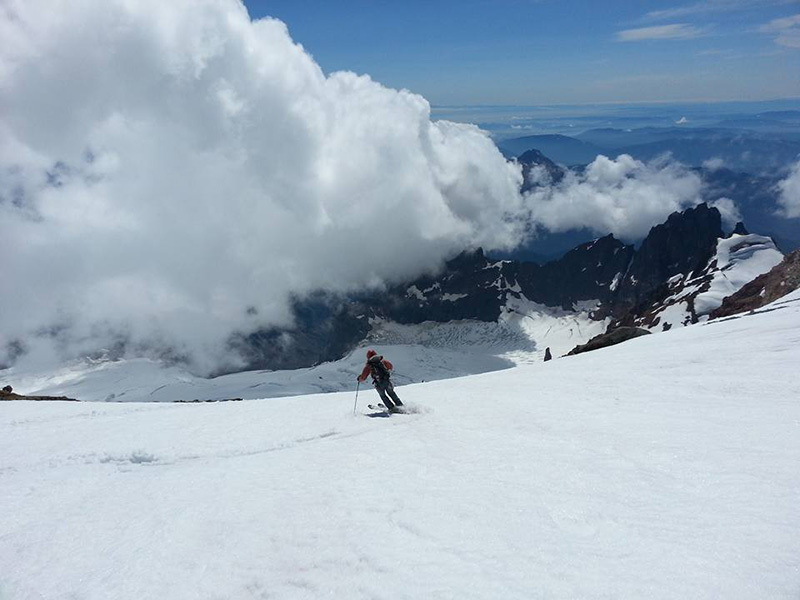 SUNNY WARM WEATHER WILL GRADUALLY GIVE WAY TO MOSTLY CLOUDY AND COOLER WEATHER AT MOUNT RAINIER NATIONAL PARK BY MIDWEEK...AND IT SHOULD CONTINUE THROUGH THE WEEKEND. THERE IS A CHANCE OF SHOWERS WEDNESDAY THROUGH SUNDAY...BUT ANY PRECIPITATION THAT OCCURS SHOULD BE LIGHT. MONDAY...SUNNY. FREEZING LEVEL NEAR 14000 FEET. MONDAY NIGHT...MOSTLY CLEAR. FREEZING LEVEL NEAR 14000 FEET. TUESDAY...PARTLY SUNNY. FREEZING LEVEL NEAR 13000 FEET. TUESDAY NIGHT...MOSTLY CLOUDY WITH A CHANCE OF SHOWERS. SNOW LEVEL NEAR 10500 FEET. WEDNESDAY...MOSTLY CLOUDY WITH A CHANCE OF SHOWERS. SNOW LEVEL NEAR 9500 FEET. WEDNESDAY NIGHT...MOSTLY CLOUDY WITH A CHANCE OF SHOWERS. SNOW LEVEL NEAR 9500 FEET. THURSDAY...MOSTLY CLOUDY WITH A CHANCE OF SHOWERS. SNOW LEVEL NEAR 9500 FEET. THURSDAY NIGHT...MOSTLY CLOUDY. FREEZING LEVEL NEAR 11000 FEET. FRIDAY...PARTLY SUNNY. FREEZING LEVEL NEAR 11500 FEET. FRIDAY NIGHT...MOSTLY CLOUDY WITH A CHANCE OF SHOWERS. SNOW LEVEL NEAR 10500 FEET. SATURDAY...MOSTLY CLOUDY WITH A CHANCE OF SHOWERS. SNOW LEVEL NEAR 10000 FEET. SATURDAY NIGHT...MOSTLY CLOUDY WITH A CHANCE OF SHOWERS. SNOW LEVEL NEAR 9500 FEET. SUNDAY...MOSTLY CLOUDY WITH A CHANCE OF SHOWERS. SNOW LEVEL NEAR 8500 FEET. Glad to hear that the PNW still has sustained good skiing vertical somewhere other than Hood & Adams -- you got in ~950' more vertical than we did the following day in the SW Chutes (though skiing the Adams summit would have come close to making up the differential, yet we suspected that the snow conditions up there would be abysmally bad). 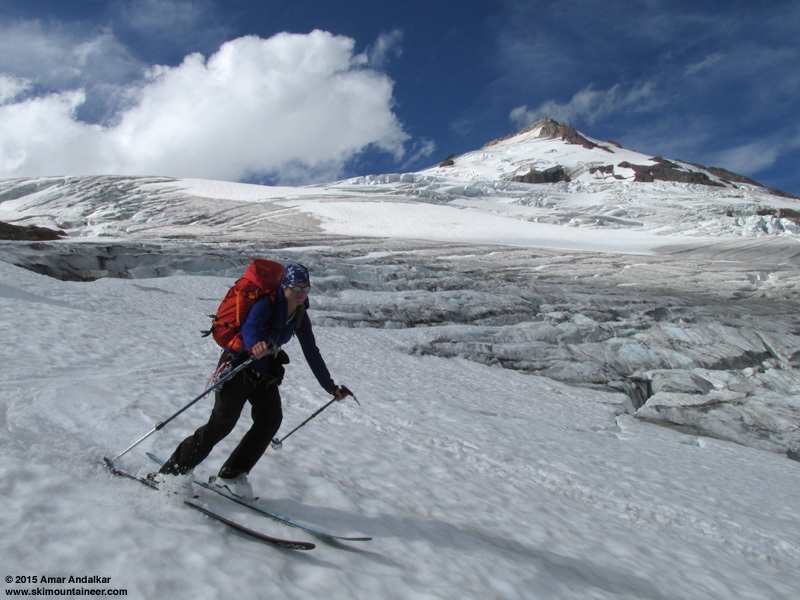 "Jill took the lead, since I had by far the most crevasse rescue experience, it was best that I trail in case of a punch-through or snow bridge collapse." ... I can't resist joking that claiming superior rescue abilities is always a great excuse to convince your partner to take the more dangerous lead! Always had the more-experienced climber locate above the less-experienced one on a two-person team, whether climbing or descending. That's because it's difficult to arrest a fall below you on a steep slope--it takes a quick and certain self-arrest. That's particularly true in icy or spring conditions. It's simple to arrest a fall above you, since gravity and rope friction does most of the work. I've tried it both ways, and the former was a struggle, while the latter was ridiculously simple--I didn't have to do anything except stand there wondering what all the fuss was about. So for the sake of narrowing the discussion (sorry for the thread drift Amar! 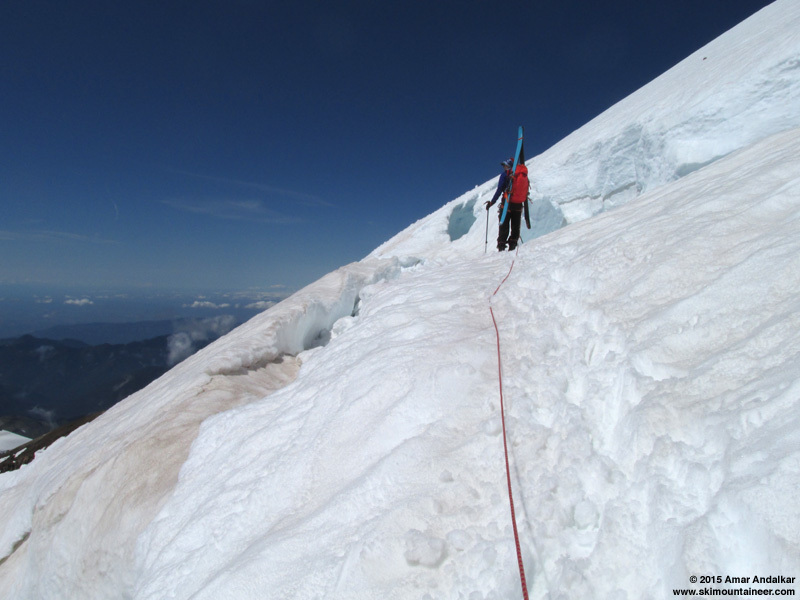 ), let's say the *only* concern is a roped partner falling into a crevasse on the ascent. 1. Potentially can set a better route avoiding a weak snow bridge. A. 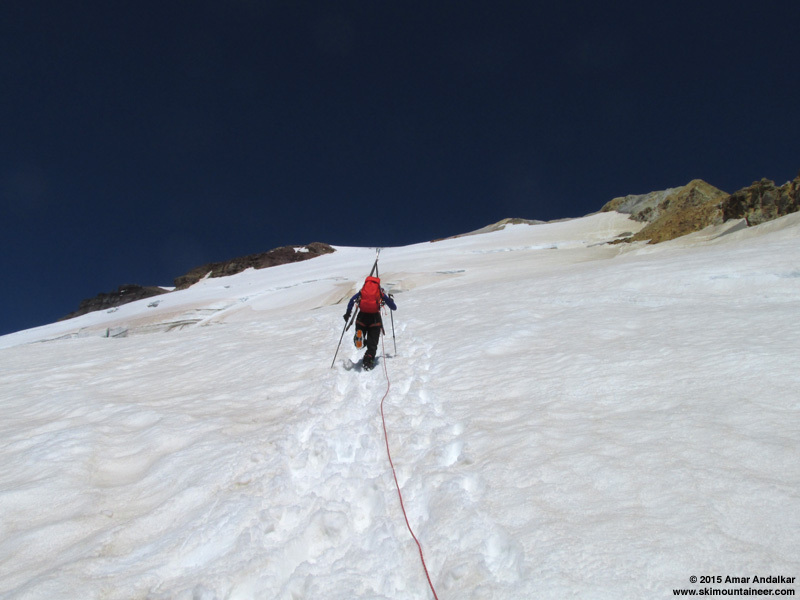 Since the first partner up the route is the more likely to fall into a crevasse regardless of skill (i.e., see #1 above), the better rescue skills should follow. Perhaps the ideal situation is that one partner has all the skills for crevasse assessment and arrest, whereas the other partner is great at rigging up mechanical advantage systems! 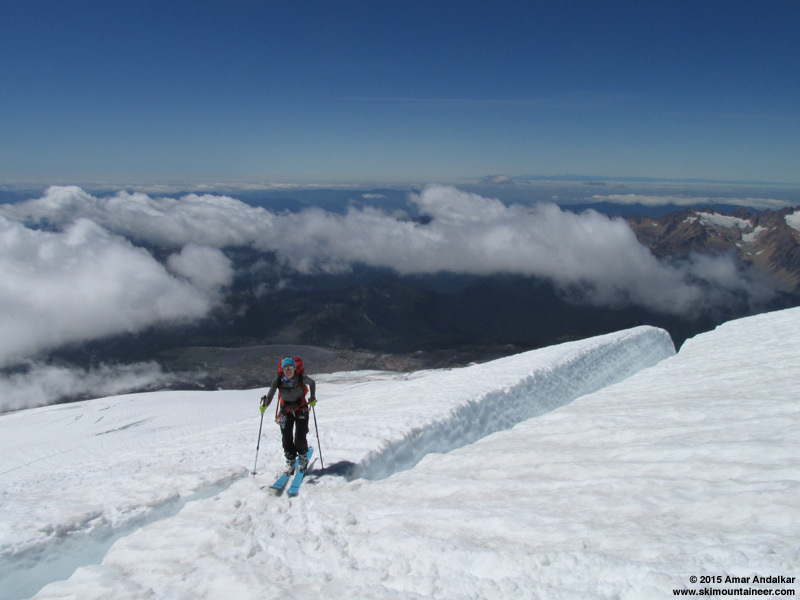 I may write a more complete trip report later this week with more photos, but here's a quick update in case anyone still wants to ski a long run in great conditions this summer! 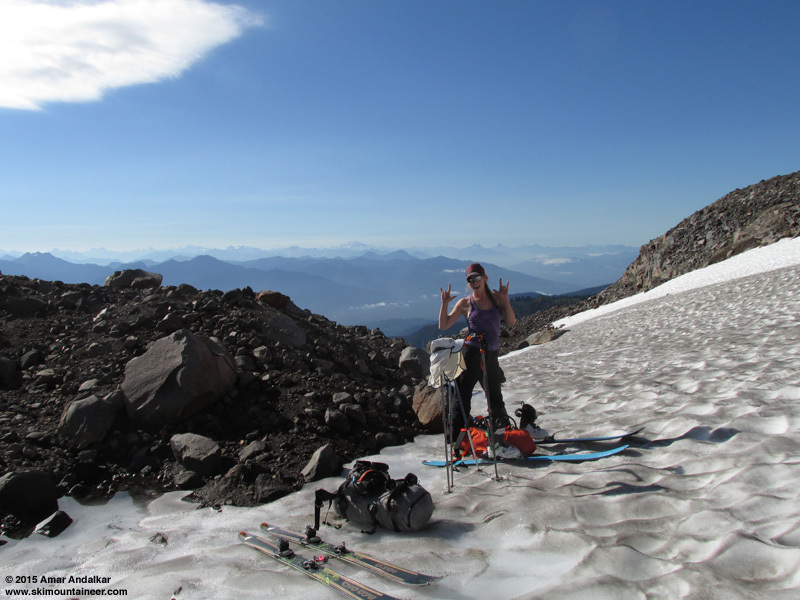 August 2: Skiing smooth corn on the Squak Glacier! Thanks for the report(s) Amar. The skiing looks great. The crevasse zigzag looks a bit spooky.